There are many uses for hot water dispensers, including not having to wait for the kettle to boil, and saving energy. However, how do you know which one to buy? The market is flooded with such products, but knowing which is good value and which is worth avoiding is vital. Never fear, we’ve reviewed some of the best around, to help you make your choice. Below is a table to provide you with a quick overview of the best hot water dispensers available. You can quickly compare key features such as capacity and power. Breville is a big named brand, so you get peace of mind from the get-go when you opt for any of their products. This particular hot water dispenser is very sleek in appearance, which means you can easily leave it out in the kitchen and it won’t look out of place. There is also an illuminated section which lights up blue, so you can see if you need to fill up for one cup more, or not. 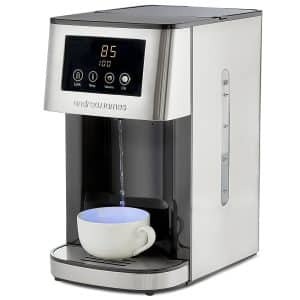 Aside from that, the main selling point is how quickly it heats up and dispenses the water – within just a few seconds you have 1.5 litres of hot water, which is around five standard sized cups, before the dispenser needs a refill. This product is also super-easy to use, you literally just fill it up from the tap as you would any other type of kettle, plug it in and away you go. You can also remove the drip tray and clean it, either manually or with the dishwasher. Best for – Those who want a sleek appearance and don’t mind a low litre capacity. If you’re looking for a hot water dispenser that will hold more than an average amount of water then this particular product is a good choice for you, giving you instant hot water. Dispensing 2.5 litres of water every time you fill it up, this product is ideal for larger households and will save you plenty of energy at the same time. In addition, this amount of water is boiled in just 5 seconds. The added extras of this product are mainly safety-focused, including a light indicator to tell you when it is on and off, as well as a red light which informs you that there isn’t enough water and it is going to turn off itself. 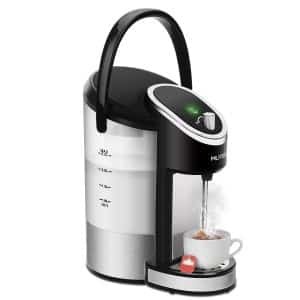 It is also very easy to use, and has the appearance of a coffee maker, so it will look attractive in any kitchen also. Best for – Those on a budget who want a sleek appearance to their product. 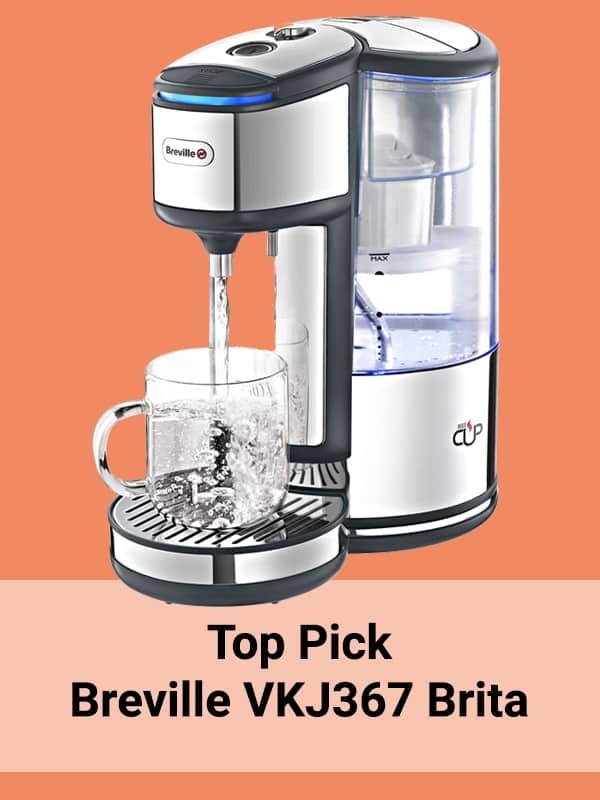 We have another Breville choice here, but this one has the added Brita filter within it. 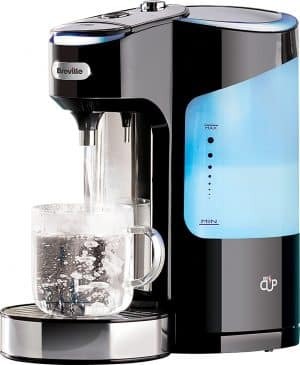 This basically means that not only will you get hot water, as you would expect from a hot water dispenser, but you will also get the purest water around, as it has been purified by the Brita filter. Everyone knows the Brita name also. You can expect a 1.8 litres of hot water within a few seconds, and you can choose between 9 different sizes of cup, whilst also being able to use it very easily; there is a stop button which you can use to add extra control. The tank is illuminated, so you can see how much water is left inside, before you need to refill it. Aside from the Brita purifier, the filter works to get rid of nasties such as chlorine or limescale from your water, installed with a Brita Maxtra cartridge within the machine. Best for – Those who don’t mind spending a little more for serious quality. Whilst this particular hot water dispenser lacks the attractiveness in terms of image as some of the other product we have reviewed, it certainly gets the job done as a boiler. The major perk is the capacity, at a huge 3.5 litres. This basically means that you can boil the water in the morning, for a percentage of the energy you would use when boiling the kettle, and you will have enough water to last you for the rest of the day. You can choose between five different temperature settings, and there is a clear section on the front, so you can see how much water is left in the tank. The push button settings on the top of the dispenser are also easy to use, and there is a digital display telling you what temperature you have chosen. Best for – Those with a medium sized household. 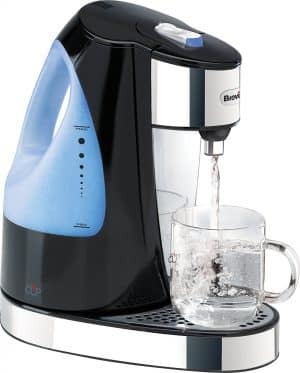 This particular water purifier looks just like a modern-style coffee dispenser, so it will not look out of place in your kitchen, whilst you’re trying to save energy. 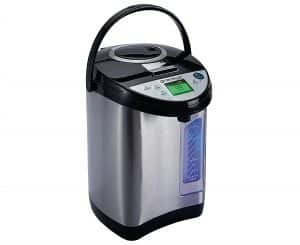 With a large 4 litre capacity, you’re certainly not going to need to re-boil again that day, and it is also very easy to use, with several safety features, including a child safety lock. The LED display also gives you extra control. The product comes with two filters which each have a large life span, of 150 litres, and these aren’t particularly expensive to purchase after they have run out. Overall, this water dispenser is very high quality, despite the slightly higher price tag as a result. Best for – Those with children, due to the child safety lock feature. If you are looking to keep your hot water more than ready all day long, then this particular water dispenser is for you. At a huge 10 litres capacity, this is ideal for a large family, or even if you want to use it during a special occasion, when you’re expecting guests. This product is also available in other litre increments, ranging from 5 to 26 litres. The downside is the appearance, because this does have the look of a hot water urn, rather than the modern coffeemaker-style. Despite that, this product more than does the job, and Swan is another big brand name for confidence in your purchase. The temperature control function is automatic, so you don’t have to worry about working dials and displays, making it one of the easier to use dispensers on our list. Best for – Those with a large household requirement. Another Breville entry on our list shows you the prevalence of this brand in the household realm. 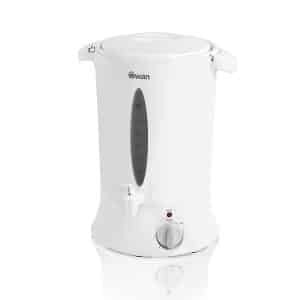 Basically, you’re getting confidence in your purchase once more, and although the litre capacity lacks a little, this is a 2 litre choice, it does give you quality, as well as an attractive appearance for your kitchen counter, working as a quality boiling water dispenser. The dispenser boils super-fast, in literally seconds, and stays warm all day long. The water tank has an illuminated section in blue, so you can easily see if you’re running low on water, and there is also a large tank window at the back. There is also a manual stop function, so you can control the water flow, and as an added safety feature. Best for – Those who want a product that is hassle-free to use. This particular hot water dispenser has several features, which make it a great consideration to go for. This product has a two litre capacity, but it also comes with a filling jug up to 1 litre in capacity, to make it easier if you need to top up halfway through the day. In just a few seconds your water is super-hot, and there is also a drip tray that can be removed and cleaned, to make it easy to keep everything clean and tidy. This feature also makes it safer to remove any water that you haven’t used at the end of the day. Another feature is that it is very easy to use, with just one button operation. The water tank is also see-through, so you can keep an eye on how much water is left. Basically, if you’re looking for a simple and easy to use dispenser, this is a good choice. Best for – Those who want a product which is super-easy to use. 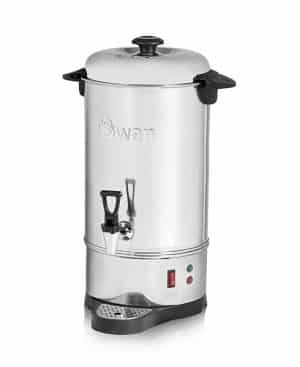 Those who are looking for a good budget option, who require large amount of hot water every day, will benefit from this particular Swan product. This dispenser is made of plastic, whereas the others are all stainless steel in design. This reduces the price of the dispenser, which is good news for buyers. There is also the option to purchase the sister product in the range, with litre increments ranging from 5 to 26 litres. This is ideal for commercial use, as the name would suggest. The tap which pours the water ensures no spillages or drips, which makes it safer and cleaner to use, and there is an indicator on the outside, which tells you how much water is left inside the tank. Best for – Those on a budget with need of larger capacity. 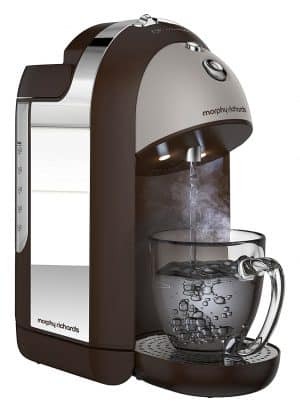 We have another big named brand here, with Morphy Richards being one of the most recognisable in this round up. This particular dispenser has a medium capacity, at 1.8 litres, which is enough for a regular household, and boils water in a maximum of 45 seconds. You can also stop the boiling process at any time with a manual stop control. The drip tray removes for easy clean, and also makes it simple to empty the dispenser at the end of the day, without spillages. The tanks also lights up to make it easy to see how much water is left in the tank. If you’re looking for an average capacity dispenser, at a good price, and a quality brand name, this is a good choice. Best for – Those who want a big brand name but easy usage. 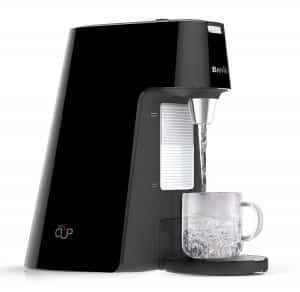 The final Breville product on our list, with an average water capacity of 1.7 litres. Again, you get the confidence of a big named brand, and it is also a very easy to use product, with a hinged lid, making it easy to fill and empty. If you find it hard to lift heavy items, e.g. a full kettle of hot water, this is a good choice for you. There is a manual stop function, so you can stop the boiling process at any time, and there is also a removal drip tray, which can be adjusted. The front window is transparent and large, so you can also easily see if there is a low water level, which needs to be filled up. Best for – Those who find it hard to lift heavy items. 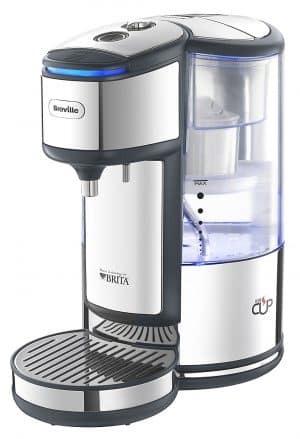 The fact you are getting Brita purifying along with the quality of the Breville dispenser makes this a great quality product. Whilst the product is made of plastic, rather than steel, this does cut down on the price a little, whilst also having a large capacity to boot. The fact this particular dispenser has a hinged lid makes it easier to pick up and empty or fill than any other of the products we have reviewed, but it is also a lightweight choice too. Any product you are considering purchasing needs to be researched ahead of actually buying it. This is because there are certain elements to think about, to ensure you get the right features you need, and that you’re not paying over the odds for things you don’t really need. In terms of hot water dispensers, it is important to consider safety features, litre capacity, and price, with a few other extras thrown in for good measure. Let’s check out the main considerations, so you can make the right purchase for your needs and budget. It is important to think about how much water you’re going to need throughout the day, before you make a purchase. If you buy a dispenser which is too small, you’re going to need to reboil it, which totally goes against the whole point of a dispenser. On the flipside, if you opt for a dispenser which is too large, you’re not going to get full use of its features, and you will probably pay more money for it as a result. Dispensers which are 8 litres and above are best used for large households or for commercial properties. If you have a special occasion coming up, or you regularly hold gatherings, then a larger capacity may be useful, but overall, the 2-4 litre mark is enough for a regular household, without needing to fill up throughout the day. Set yourself a budget and then do your research, making sure that you have a realistic amount in mind. If you go for the biggest brand names, yes you get peace of mind that you’re purchasing quality, but you are likely to spend more money overall. If you check out lesser priced items, you may be pleasantly surprised at the quality you get, for a lesser price tag. Remember that the whole point of buying a water dispenser is that you save money, because you don’t need to keep boiling your kettle and using energy, via your water bill. An extra you might like to look for is a manual stop function. This means you can stop your dispenser from boiling at any time, giving you control over the process. The major perk of having a drip tray means that it is going to be much cleaner and less messy to use your dispenser. When you are pouring your water, there will be less mopping up to do. Also, when you go to pour out any remaining water at the end of the day, a drip tray will cut down on the chances of you burning yourself. Basically, a drip tray is both a safety feature and an added extra. By now you should be quite clear in your mind which type of hot water dispenser is the one for you. 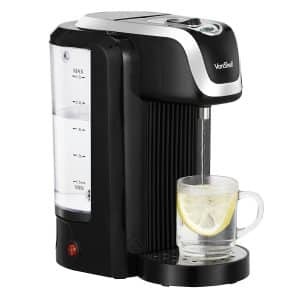 We have reviewed several of the Breville models, and this is without a doubt the most popular brand name on the market. Despite that, Breville dispensers do tend to have a lesser litre capacity, compared to some of the their models we have reviewed. If this isn’t a concern for you, then Breville is a fantastic brand name option to go for. Overall, the key features to look for when opting to buy any type of water dispenser are price, brand name importance (whether it is vital to you or not), litre capacity, and any added extras such as a drip try or manual stop feature. There is no doubt that a water dispenser is going to save you money on your energy bill, and it will also save you time. If you’re desperate for that cup of coffee, not having to wait for another few minutes will be vital to your day’s productivity!